We reject the accumulated knowledge of our forefathers at our own peril: Case in point, the 750cc inline-Four, the motorcycle that made Japan Japan nearly 50 years ago with the first Honda 750. 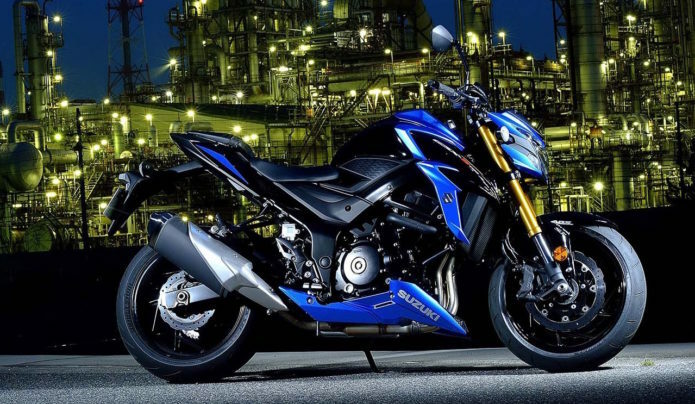 We liked the GSX-S750 a lot when it was new in 2015, but it still lost out to the Yamaha FZ-09 in this comparison, due to various cost-cutting measures and a certain lack of refinement. Its screaming mimi of a high-revving powerplant was a big hit, though, and the rightness and lightness of the overall compact package was there from the beginning. For 2018, Suzuki has done right by the GSX-S, seriously upgrading something like 75% of its components – enough for them to claim it’s an entirely new motorcycle. Well, that (steel) frame looks the same as before (but there’s a cool new also-steel swingarm). And while we’re still using the same 2005 GSX-R750 engine cases, there’s enough “new” going on for Suzuki to claim eight more horsepower up top – 112.6 at 10,500 rpm. The claim for the previous version was 104.6, which worked out to 96.1 rear-wheel hp at 10,300 rpm on the MotoGP Werks dyno.